The family of the late Dr. Richard A. Crowe would like to continue Richard’s legacy in the fields of astronomy and music. Two scholarship funds have been established in his name: One for future astronomy students at UH Hilo where he lived and taught, and one for future music students at The Royal Conservatory of Music in Toronto, Ontario where Richard studied piano when he lived in Canada. Family and friends have come together to establish this endowed scholarship in memory of Dr. Richard A Crowe. This endowment is a tribute to Dr. Crowe’s many accomplishments in the field of astronomy and it will be used to provide assistance to undergraduate students majoring in astronomy at the University of Hawai‘i at Hilo College of Arts and Sciences. Currently we are working towards getting this scholarship endowed in perpetuity. Please help us reach the $25,000 mark! Donate online now to the Richard A. Crowe Memorial Scholarship in Astronomy! Richard became interested in music at an early age and studied piano. As he pursued a career in astronomy, he maintained a keen interest in music of all kinds. He regularly participated in local musical events, ultimately into musical plays not only at the piano but also acting and singing. Having moved to Hawai'i in a full time faculty position at the University of Hawai'i at Hilo, he also became a regular member of the Hawaii County Band playing clarinet. The piano music you can listen to on the soundcloud player (above) was created at the time Dr. Crowe was furthering his piano skills for accreditation through the Toronto Royal Conservatory of Music. The family of the late Dr. Richard A. Crowe would like to celebrate Richard’s passion for music and his many contributions he made to the musical community. In doing so, a Canadian scholarship for future music students at The Royal Conservatory of Music has been established in Toronto, Ontario, where Richard studied when he lived in Canada. Many of the donors, alumni, and students of The Conservatory are from the United States, and therefore The Conservatory is pleased to accommodate their tax filing requirements. The Conservatory accepts gifts from US-sourced income and provides tax receipts through its 501(c)(3) affiliate, Royal Conservatory of Music Foundation (U.S.). Donate online now to the Richard Crowe Memorial Scholarship in Music! Richard was born in Montreal, Quebec, February 12, 1952 to proud parents William and Erna Crowe. He was the eldest of three, with two younger sisters, Carolyn and Mary-Ellen. Having a love for the stars ever since he was little, by the time he entered his mid-twenties, Crowe already had an extensive background in observatory support work. Between 1977-79, he was the resident observer for the University of Toronto 24-inch Southern Observatory at Las Campanas, Chile. He received his bachelor of science and master of science degrees in astronomy from the University of Western Ontario in 1977. Immediately after earning his doctorate degree in Astronomy from the University of Toronto in 1984, he became the Canadian resident astronomer for the Canada-France-Hawai‘i Telescope until 1987. During his residency at CFHT, he had scientific responsibility for the high-resolution spectrograph, and was the observatory’s public relations officer responsible for preparing the publication of the CFHT Information Bulletin. In 1985, Richard moved to the east side of the Big Island when in 1987 he joined the Hilo branch of the University of Hawaii (UHH) and co-founded the astronomy program with William Heacox, the department's current Chairman. In 1991, Crowe was selected as a Fujio Matsuda Research Fellow by a university-wide committee for his scholarly work on pulsating variable stars. He regularly trained UH Hilo student observers with the UH 24-inch telescope on Mauna Kea, and conducted many research programs on that telescope. Professor Crowe’s teaching responsibilities ranged from introductory physics and astronomy to quantum physics, classical mechanics, thermodynamics, electromagnetism, astrophysics, and senior level quantum mechanics. He developed many on-line Web assignments and course presentations, including general astronomy, general astronomy laboratory, observational astronomy, stellar astrophysics, galactic astrophysics, comparative planetology, and climate change. In 2005, he won the AstroDay Excellence in Teaching Award for his efforts. Dr. Crowe was very active in promoting knowledge of astronomy through his outreach work in Hawaiian schools. He was principal investigator on the New Opportunities through Minority Initiatives in Space Science (NOMISS) grant ($675,000) funded by NASA, and a co-investigator on the Keaholoa grant ($2,413,000) funded by the National Science Foundation. These grant programs were designed to encourage local and Hawaiian students to enter careers in space science by working with K-12 teachers and integrating astronomy with Polynesian skylore, voyaging, and Hawaiian culture. While doing this, Crowe delivered over 50 StarLab presentations in both public and private schools, and participated in formal voyaging canoe (the Wa‘a Makali‘i) training. 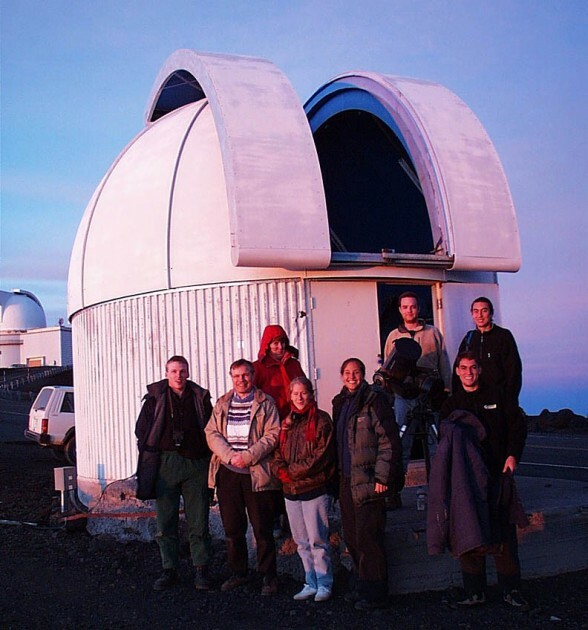 In 2001, Crowe and Alice Kawakami, then a professor of education at UH Hilo, won City Bank’s TIGR Award in Astronomy for NOMISS community outreach efforts. In 2002, he completed a revised version of Stars Over Hawai‘i, a popular book that integrates modern astronomy with Hawaiian skylore and navigation. Professor Crowe served as chair for the UH Hilo Department of Physics and Astronomy from 1992-2002, and was a member of the UH Hilo Sigma Xi Chapter since 1990. For its activities while he was chapter president in 1991-92, the UH Hilo Sigma Xi Chapter was awarded the prestigious Certificate of Excellence by a national committee. He also represented UH Hilo at the 1991 Sigma Xi Forum on Global Change and the Human Prospect held in Washington, D.C., at the 1996 Sigma Xi Forum on Science, Technology and the Global Society held in San Diego, and at the 1999 Sigma Xi Forum on Reshaping Undergraduate Science Education held in Minneapolis. Crowe also delivered many public and school lectures on the subject of astronomy. He was a co-team leader on the Journey Through the Universe program, and was active in publicly promoting science education and critical thinking, having written 18 Hawai‘i newspaper articles on these subjects. Professor Crowe was the astronomer-in-residence at UH Hilo’s ‘Imiloa Astronomy Center of Hawai‘i starting in 2006, and did many planetarium presentations in that capacity. In 2010, Crowe and ‘Imiloa Planetarium Manager Shawn Laatsch were presented with the prestigious UH Hilo Taniguchi Award for Innovation in Teaching and Research for using the planetarium to teach introductory astronomy. Dr. Crowe was very active in the community. He had been a member of the Rotary Club of Hilo Bay since 2002 and served as club president from 2007-2008. He was an accomplished pianist and musician, having studied earlier at the Royal Conservatory of Music in Toronto, ON under James Anagnoson, current Dean of the Glenn Gould School of the Royal Conservatory. Crowe was an active member of the Hawai'i County Band since 1986, playing clarinet, and had been a member of the UH Hilo Wind Ensemble, the UH Hilo Orchestra, the University Chamber Singers, the University Chorus, and the Kanilehua Chorale. Crowe also acted in, or conducted several musical productions in West Hawai‘i, including West Side Story, South Pacific, and Company. In 1992, he performed Gershwin’s Rhapsody in Blue as a solo pianist with the Hawai‘i County Band. Crowe's main research interests were pulsating stars, stellar evolution and spectroscopy. He was co-author of 47 scientific publications (16 first author), 25 of them major ones listed in the Web of Science, with a Hirsch citation index of 13. Crowe also authored nine articles, two of them major ones listed in the Web of Science, that critique astrology, UFOlogy, Mars “face” claims, and creationism. During his career at U of H, he earned many awards which led to study in astronomy centers around the world including France, Chile, Japan and Canada. Crowe's many publications are listed in the Astrophysics Data System. Aside from Richard's devotion to his work and his community, he was also a very loving husband and father. He cared deeply for animals and had a passion for nature and photography, which inspired his love for travel. Although he was a scientist, he was a very open-minded individual with a compassionate and kind heart. Richard was able to live his life to the fullest and spread his aloha far and wide, from his home, to his community, to the world, and out into the universe. A memorial service celebrating Dr. Crowe's life and his many accomplishments was held on Sunday, June 24th, 2012, at the ‘Imiloa Astronomy Center of Hawaii in Hilo and proclaimed "Dr. Richard Crowe Day" by Mayor Billy Kenoi.